The Screen Overlay Detected error can be one of the most frustrating to come across on your phone. It often appears when you're about to dive into a new app or make a purchase on a store, then suddenly your phone stops you for what appears to be an arbitrary reason. Fortunately, getting around it is easy. What is the Screen Overlay Detected Error? 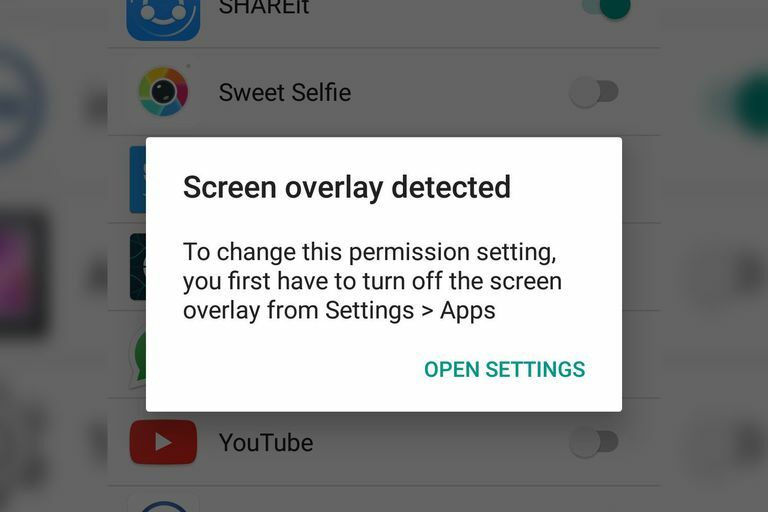 The screen overlay detected error usually appears as a popup that reads: "To change this permission setting, you first have to turn off the screen overlay from Settings > Apps." Although it provides you with a quick link to your device's settings and some basic instructions on how to fix it, the solution to this problem isn't immediately obvious, nor does it give you much detail on why it's blocking you in the first place. Screen overlays are a function used by a number of applications to draw over other apps, enabling them to continue operating even if you have another app open. Think Facebook Messenger's chat heads, which can pop up when you're doing something else to let you know you've received a message. However, the function could be used maliciously to hide information from a user, thereby tricking them into agreeing to, or paying for, something they didn't want to. The error message appears to ensure screen overlay is turned off before making important decisions on your device. Which Devices are Affected by Screen Overlay Detected Errors? Any device that supports screen overlays is susceptible to the screen overlay detected error. Samsung and Lenovo devices may be some of the most common to encounter the error because they tend to be more popular, but whatever Android device you have, you have an equal chance of running into the problem. This error has been reported to appear since at least Android 4.1 Jelly Bean. There have been changes to the way it appears and how it can be fixed over the years, with Google introducing a much more streamlined system settings menu with the release of Android 8.0 Oreo, making the problem much easier to counter. In order to bypass the screen overlay detected error you need to disable the draw overlay function of the app getting in the way. You can re-enable it later if you wish, or leave the function off permanently to hopefully avoid this problem in the future. Tap Settings, if you know where it's located. If not, use your device's built-in search function to search for it. When found, tap it. Tap the magnifying glass in the top right-hand corner. Type “Draw” and tap Draw over other apps when it appears. Alternatively, or if that doesn't work, go to Apps > Cog icon > Special Access > Draw over other apps. You’ll be presented with a list of all of the applications on your device which can draw over other apps. If you suspect you know which app is causing the screen overlay error, tap that particular application and use the toggle to disable its ability to draw over other apps. Some commonly problematic applications that have been noted to cause the screen overlay detected error include Facebook Messenger, ES File Explorer, and Twilight, but there are likely to be many others as well.